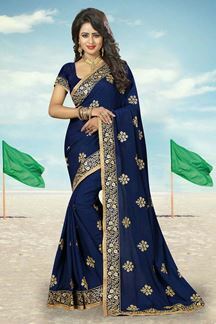 Carry an elegant exuberance wearing this royal blue sheer georgette saree decorated all over in floral zari buttis for enhancement while the finishing border all over the adorning side as well as along the length of saree is done in beautiful zari embroidery accentuated with stones for an incredible graceful impact! This saree is accompanied with matching fabric blouse piece. The blouse in the picture is for photo purpose only. Note: Color may slightly vary due to digital photography.